iMacsoft DVD to Mobile Phone Converter is professional and easy-to-use DVD to Mobile Phone converter designed just for Windows users to rip and convert DVD to Mobile Phone video and audio formats with high speed and excellent quality. iMacsoft DVD to Mobile Phone Converter can fast rip and convert DVD to Mobile Phone 3GP, 3GPP ,MP4, AVI, WMV video formats and WMA, MP3, AAC, M4A audio formats for enjoy your DVD on Apple iPad, iPhone, iPod, Sony PSP, Palm, Pocket PC, and various brands of cell video phones including LG, Motorola, Nokia, Samsung, and Sony Ericsson and so on. 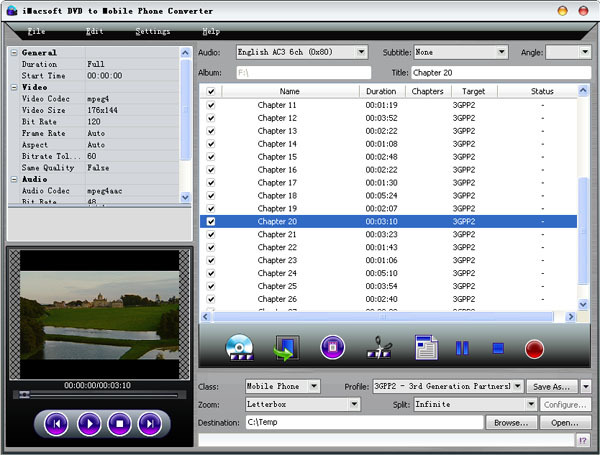 With iMacsoft DVD to Mobile Phone Converter, you can select DVD subtitle and audio track, select any DVD chapters/titles to convert, and even trim your chapters/titles to capture your favorite clips. It also provides a series of powerful settings which let you customize file size, split output file to fit your CD-R or other device, convert DVD movies with any available languages, set video and audio bitrate, adjust resolution, set frame rate and so on. Now free download and try this professional DVD to Mobile Phone Converter software and make your Mobile Phone a mini movie theatre!